Russia's OAO Uralkali has blasted the global potash market wide open sending stock prices in the sector off a cliff. 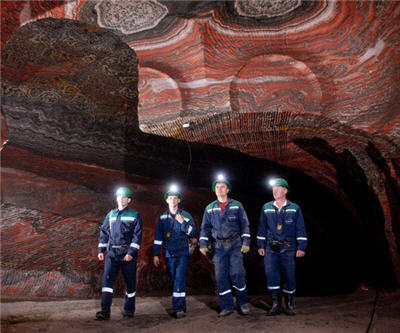 Uralkali is the world's largest potash producer and on Tuesday announced it's ending the decades-old distribution arrangement with Belarus, which controls roughly 43% of global exports, to go it alone. CEO Vladislav Baumgertner sees the price falling below $300 a tonne before the end of the year from a Vancouver FOB price for the soil nutrient of around $400 a tonne at the moment. A sub $300 a tonne price is a world away from five years ago when rising Chinese and Indian consumption drove the potash price from $100 a tonne in 2004 to almost $900 in the run up to the 2008 recession. Uralkali, which also announced it's upping output, was the one producer which could pull this off. Its production cost is a paltry $62 a tonne, compared to at least $100 in North America and $240 in Europe. The reaction on markets were swift and brutal. Uralkali (MCX:URKA) fell as much as 25%, Potash Corp. of Saskatchewan (TSE:POT) gave up more than 20%, while the Canadian company's North American partners Agrium (TSE:AGU) and Mosaic (NYSE:MOS) dropped 4.5% and 19% respectively. Germany's K+S (OTCMKTS:KPLUY) was trading down 23%, Israel Chemicals (TLV:ICL) declined 18%, Sirius Minerals (LON:SXX) hoping to build a potash mine in Yorkshire gave up 15%, while Intrepid Potash (NYSE:IPI) in the US was one of the biggest losers, plummeting 29%. Saskatchewan's junior players hoping to build mines in the Canadian province including Karnalyte Resources (TSE:KRN), down 46% and Vancouver's Encanto Potash (TSE:EPO), losing 44% were some of the hardest hit. Western Potash (TSE:WPX) came off relatively lightly with a 9.5% slide. Allana Potash (TSE:AAA) which is advancing a project in Ethiopia and Verde Potash (TSE:NPK) active in Brazil, also lost more than a fifth in value. Brazilian giant Vale's (NYSE:VALE) recent decision to walk away from an expensive potash project in Argentina is looking prescient while world number one miner BHP BIlliton's (LON:BHP) Jansen project in Saskatchewan now looks unlikely to get the go-ahead.